Why come to Puerto Rico when you could vacation in Mexico, or Miami, or even the Dominican Republic next door? Excellent question. Come to Puerto Rico to experience the bizarre sensation of being in an entirely different country (gas by the liter, roads by the kilometer, Spanish is spoken) while still being in the United States (same dollar, same president, no need for a passport). A trip here is a 3-for-1 bargain of Caribbean beaches, tropical rainforests, and splendid mountainscapes -- with the rare added bonus of not one but three bioluminescent bays. There’s enough to see and do in Puerto Rico to keep you busy for weeks. 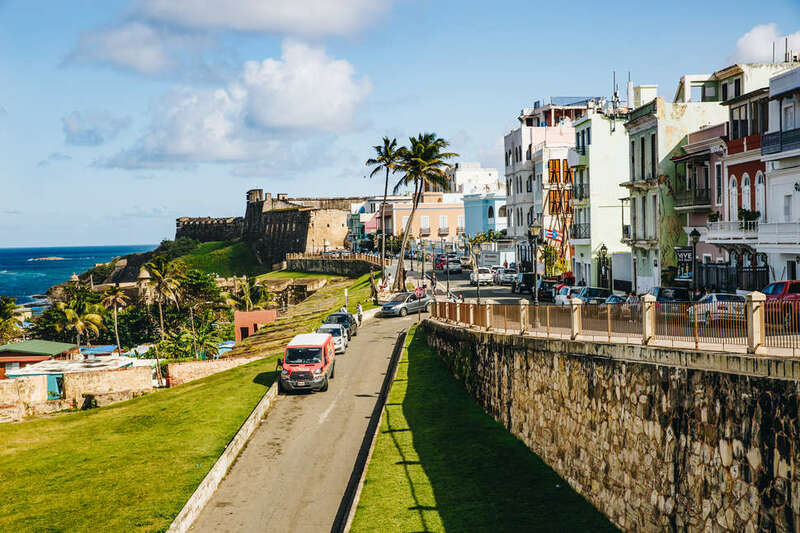 That said, at the top of any Puerto Rico itinerary should be San Juan, the vibrant capital city where the majority of the island’s visitors disembark. Established in 1521, this is the oldest European-founded settlement in the US and the second-oldest in the Americas. You don’t have to squint too hard to see that rich history around you: The pastel-colored Spanish colonial buildings and narrow cobblestone streets of the Old Town are protected by 17th-century fortresses and a 15-foot-thick zigzagging wall. 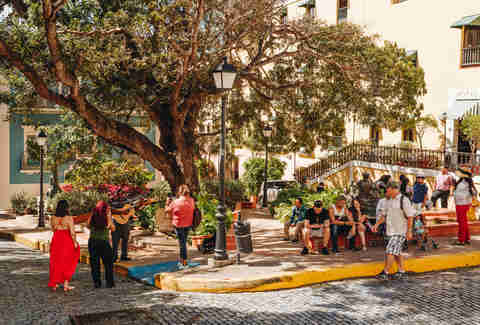 Take a walking tour around Old San Juan to get the full effect. Also of historical import: The piña colada was invented here. But San Juan is more than just charming old stuff and tourist shops. It’s a mosaic of ever-evolving neighborhoods, like the cosmopolitan Miami vibes of Condado, or the hipster bars and street art of Santurce. Whether you’re here for the day or staying for an entire week, here are the best things to do in San Juan. 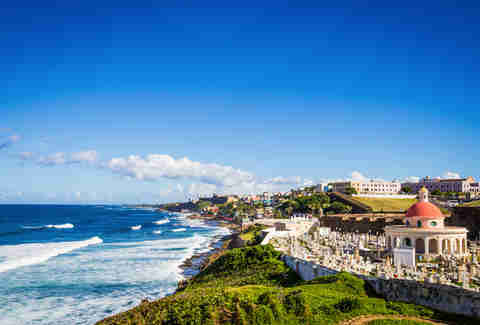 Tour the history-packed San Juan, zip line through a tropical rainforest, and hit the beach. Let’s get the touristy stuff out of the way first, shall we? Two gigantic citadels front San Juan’s northern face. To the west, the 16th-century Castillo San Felipe del Morro (commonly known as El Morro) is undoubtedly one of the most well-known attractions in Puerto Rico. With its strategic location overlooking the San Juan Bay, El Morro defended this port city from 1539 to as recently as WWII. 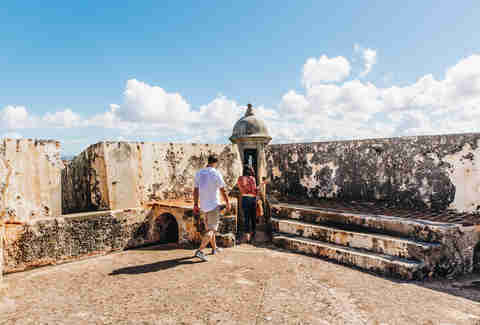 Entry into El Morro costs just $7.00 -- save your ticket, because it also includes entry to “that other fort,” Castillo San Cristobal, within 24 hours of purchase. This is basically El Morro’s overlooked little sister, but San Cristobal is cool too! It’s the largest European fortification in the Americas and features the infamous Devil's Guerite (Garita del Diablo). Legend has it that soldiers would randomly disappear as they stood watch in this guerite. It's about a mile walk from one fort to the other, and the stroll alone is breathtaking, with pastel colonial houses on one side and an arresting blue sea on the other. A mammoth esplanade fronting El Morro serves as a national gathering spot, and is a great place to take a break. After you visit the forts, stroll the waterfront down to La Fortaleza, another walled compound where the island's Governor lives. You’re not allowed to go in -- it’s literally the Governor’s home and office -- but you’ll see it from the gate. In recent years, the First Lady has taken the initiative to decorate Fortaleza Street leading up to the main gate. At the moment, it’s adorned with hundreds of colorful umbrellas floating above the street. Since 2012, the entry doors of a dilapidated building on San José Street have become an important symbol for Puerto Ricans living under the island’s current economic crisis. 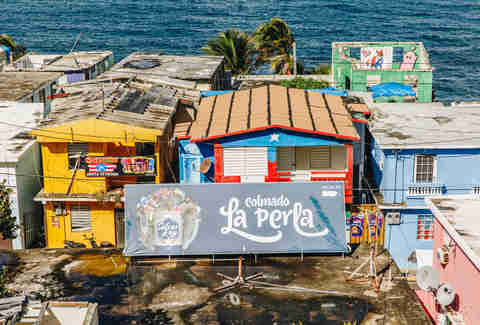 Artist Rosenda Álvarez originally painted the doors with the Puerto Rican flag, only to revisit her mural four years later, mute the red and blue colors of the flag, and paint them black instead. 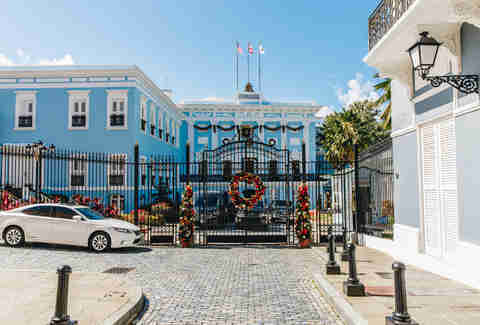 It was a criticism to the controversial fiscal oversight board that is now controlling the island finances. The building is now a popular selfie spot among tourists and locals. Even though it’s located right next to El Morro, this colonial-era cemetery is often overlooked by tourists. It lies just outside the wall, facing the sea. 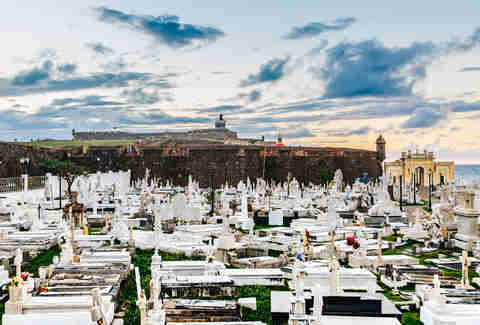 The Santa Maria Magdalena de Pazzis Cemetery is the final resting place of several prominent Puerto Ricans -- among the most famous names found here are Pedro Albizu Campos, Jose Celso Barbosa, and José de Diego, among many others. If you see a small kart with the word “piraguas” written on it, do not hesitate! Piraguas are crushed ice cones flavored with local fruit syrups like cherry, passion fruit, strawberry, tamarind, coconut, and lemon. Unfortunately they’re a dying tradition, but they can still be found in Old San Juan, especially near El Morro and Paseo la Princesa. You’ll also notice homemade popsicles sold here and there at residents' front doors, usually for $1. These are paletas, flavored with just about every fruit on the island. Guava. Coconut. Other stuff. I bought one that was an orange-and-cream mix, and I found it somehow gooier than I'd expected. It was also really refreshing. Which was necessary around midday in the summer, when the city can be, ah, I'll just say it, oppressively hot. 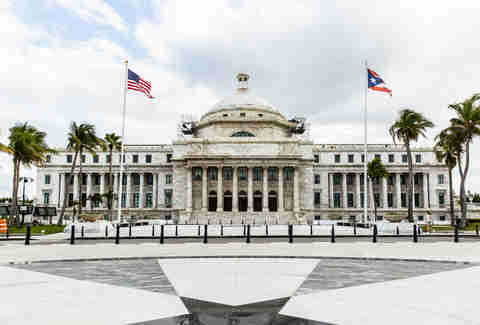 The capitol building is a marble structure fronting the Atlantic, not far from Fort San Cristobal. Entrance is totally free, Monday through Friday. Gaze upward at the ceiling, where the history of Puerto Rico is depicted in a stunning, detailed mosaic. Stand in the center of the rotunda, and you’ll be surrounded by glass-encased copies of the Puerto Rican and U.S. constitutions. Outside, the Puerto Rican and U.S. flags fly side by side. First, check out the museum at Casa Blanca, a house built for the Spanish explorer Ponce de León and his family. De León, who famously (and futilely) searched for the fountain of youth, died on an expedition before he could move in. Walk a few blocks to the San Juan Bautista cathedral where Ponce de Leon did move in, and where he'll stay for eternity; he's entombed inside. There’s nothing fancy about the architecture, but San Juan Bautista is the oldest cathedral in Puerto Rico and the second oldest in the Americas. In addition to the tomb of de León, it contains the shrine to Carlos Manuel Rodríguez Santiago -- the first Puerto Rican and the first layperson in the history of the United States to be beatified. 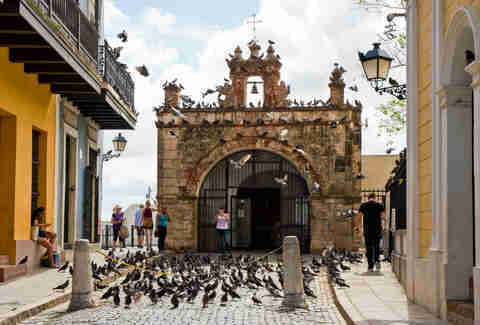 About three blocks down from San Juan Bautista Cathedral, you’ll find this small chapel renowned for its healing powers. Built in 1753 at the edge of a stone cliff, this is the site where a miracle (supposedly) took place. The story goes that in 1753, a rider in the traditional horse race of the San Juan Bautista celebrations lost control of his horse, plunging to the cliffs below. The Spanish Secretary of Government, Don Mateo Pratts, watched the event unfold as he cried out, “Christ of Good Health, save him!” The horse didn’t survive the fall... but the rider did. Ever since, thousands of faithful Puerto Ricans come on a weekly basis to pray for their own miracle. Note that the chapel is only open Saturdays and Sundays. If you’re cool with pigeons and would like to recreate your favorite scene from Home Alone 2, wander into Parque de las Palomas (right next to Capilla del Cristo). As the name suggests, the park is plagued with hundreds of pigeons waiting for you to feed them corn or bird food, which you can buy from a local seller for a buck. They’ll stand on your head, arms, and shoulders as you feed them. There are six shady plazas carved into the Old San Juan street grid. Walking around one afternoon, I came across Plaza Felisa Rincon de Gautier. It’s right outside the old Bautista Cathedral, and named after the city's first woman mayor. A busker who works the plaza every day was strumming an old ballad on his guitar. Two women, maybe in their 60s, very likely sisters, were singing along with him. They were belting it, really loud, getting really into it. The song brought out such emotion in them that I found myself choking up. When the song ended, the women cheered, hugged the guitar player, and went on their way. "That's very Puerto Rico," said a friend who lives on the island. "That's what we do." Obviously, you can’t visit Puerto Rico and not go to the beach. Some of the island’s most stunning beaches are actually outside of San Juan. But there are several popular beaches worth a visit within the city, like Condado Beach, Ocean Park Beach, Pine Grove Beach. La Perla has had a bad reputation for literal centuries. This historic shanty town was originally established in the 19th century to house former slaves and homeless servants who weren’t allowed to live within the city walls. Today, the neighborhood enjoys new-found fame as the place where Luis Fonsi filmed his music video for “Despacito.” It was hit hard by Hurricane Maria and is still in the midst of rebuilding. If you’re in the area on a Sunday night, go partying at La 39 Bar, a makeshift bar built on the roof of a house that was partially destroyed during the hurricane. Order a Medalla, the most popular beer in Puerto Rico. Also featured in the “Despacito” music vid is the speakeasy La Factoria. This place is so famous among locals, it doesn’t even need a sign outside. It’s located where the popular Hijos de Borinquen bar used to be (you can still see the original name inside, painted on the wall), and La Factoria retains the low-key vibe of the iconic original. It's tourist-friendly, but as you make your way inside you'll find more than tourists drinking -- and dancing -- there. Beyond the hidden back door are four more individual spaces, including a wine-bar, dance floor, and cellar-like bar -- each with its own music, vibe, environment, drinks, and food. You might even get spendy and drop $9 on a cocktail. Puerto Rico has no shortage of delicious street food, especially now that the food-truck craze has taken over the island. But, Puerto Rico has had its own traditional food-truck dish for decades now -- it’s called tripleta. What’s a tripleta? It’s a sandwich. Tripleta means three, so this sandwich has marinated grilled cube steak, ham or pork, and chicken. It is served on a loaf of sweet potato bread with chips, mayonnaise, and ketchup. Trust me, it is delicious! 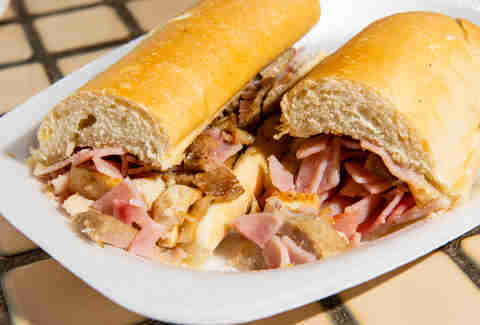 Among the most popular tripletas is El Churry, found in Isla Verde and many other locales. Ashford Avenue feels like a Caribbean version of Miami Beach with its Miami-style architecture, high-end stores, trendy hotels, and beachfront cafes. Walk along the avenue to soak in the atmosphere, chill at the beachfront Ventana del Mar Park, have a vibrant night at the historic La Concha Resort, or listen to live bands at the Hard Rock Café. 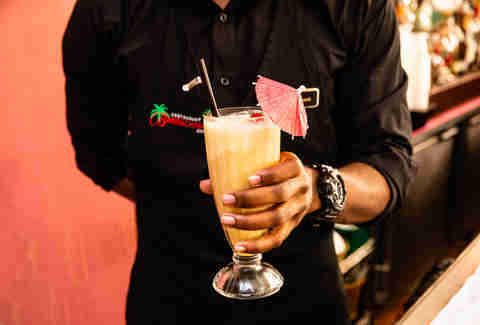 Even though folklore takes the piña colada as far back as the 19th century, when Puerto Rican pirate Roberto Cofresí offered his crew a cocktail made with coconuts, pineapple, and rum to boost their morale, the “official” piña colada wasn’t invented until 1954 by Ramón "Monchito" Marrero at the Caribe Hilton. On the other hand, the famous restaurant Barrachina also claims that their bartender Don Ramon Portas Mingot invented the drink in 1963. While the hotel got the governor’s recognition in 2004 to commemorate its 50th anniversary, both locales still argue on who’s the real inventor of Puerto Rico’s National Drink. So, why not drink a bunch of both and decide which one is the most delicious? If you’ve got money to burn, you must head to Plaza Las Americas -- the largest shopping mall in the Caribbean and the second largest in Latin America. With over 300 stores and “the center of it all” as its slogan, this mall does indeed have it all, from high-end stores to local arts and crafts. 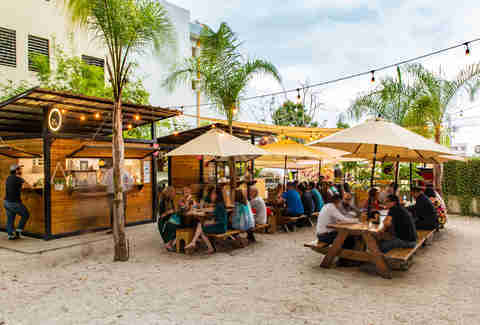 Located in the hip Santurce neighborhood, Lote 23 is basically a modernized version of the traditional beachside kiosks commonly found around the island. Here you’ll find young chefs using locally sourced products, experimenting with traditional Puerto Rican cooking techniques and new trends. Snack on criollo dishes, burgers, “Asianrican” dishes, fish tacos, cocktails and craft beers, and more. It’s an open environment with picnic tables and live music, or if it’s a game night, a giant screen to watch sports. Commonly known as La Placita, or the Little Market, this is the most popular hangout for locals during the weekend, especially Friday nights. Located in Santurce, La Placita is actually a colonial-style produce market during the day, but once it closes in the afternoon, the bars and restaurants surrounding it come to life until the early morning hours. You’ll find everything from reggaetón music clubs, to salsa dance floors, to gay bars, and even upscale restaurants, all in one place. The best part is how the crowd mixes on the street and hops between locales based on their mood. You’ll see no shortage of impressive, colorful murals all over San Juan, but if street art is your thing, head to the Santurce. 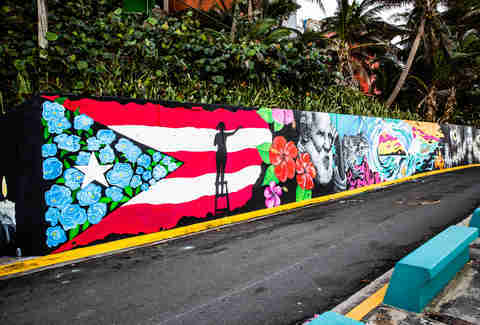 The annual contemporary art festival Santurce es Ley attracts some of the world’s most talented street artists to decorate rundown buildings and empty parking lots around the neighborhood with stunning, large-scale murals. You’ll spot the majority of these colorful masterpieces on a walk down Calle Cerra and along its side streets. It’s often compared to Miami’s Wynwood District, and in fact features work from some of the same artists. The biggest mistake you could make in Puerto Rico is not leaving San Juan. This fascinating island is small enough that you can get anywhere in just a few hours, but absolutely packed with diverse landscapes like mountains and flat farmland and bioluminescent bays -- heck, there's even a rainforest! 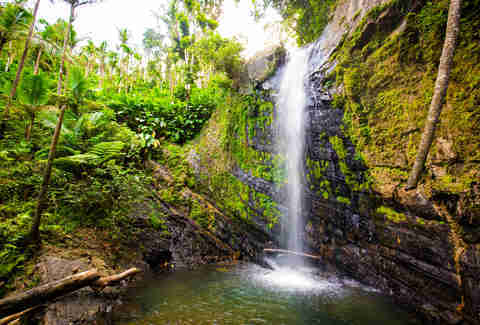 El Yunque National Forest -- yep, run by your very own US Forest Service -- is an easy day trip from the city; ride up in the morning, be back in the Old Town in time to watch the sunset over the harbor. Just $4 gets an adult into the park. Another easy day trip from San Juan is visiting one of Puerto Rico's sister islands, Culebra or Vieques. You can catch the ferry (which leaves from Ceiba) to either island. Culebra is more low-key, with fewer restaurants and services, but it does have Flamenco Beach, regularly ranked one of the best beaches in the Caribbean. Vieques also has beautiful beaches, like Playa Caracas and Playa Negra, plus fun nightlife and waterfront restaurants. Stay overnight and go on a night kayaking trip at Mosquito Bay, the best and brightest bioluminescent bay in the world. The best time to go is in the darkness of a new moon. Robert Andrew Powell is the author of three books, most recently Running Away: A Memoir.